“I’m 19 days into my 31 days of yoga challenge – that challenge being to do yoga everyday throughout the month of October. The kidlets have become quite used to me, trying to stand on one leg (usually unsuccessfully) or laying on the ground with my eyes closed “ignoring them.” Isabelle (8) will quite often sit down on the sofa and watch – which is handy when I can’t see the screen, as she let’s me know when it’s time to transition. On the other hand, Elias (7)will either completely ignore me enroute to his playstation located on the other side of the room or hug me whilst telling me that I’m doing a good job (which can be a little disconcerting if you happen to have your eyes closed at the time). I guess it’s lucky that I have three mats ..
First thing I noticed is that my kidlets aren’t anywhere near as bendy as other kids of their age and neither of them seems to know where their limbs are in space LOLOL. 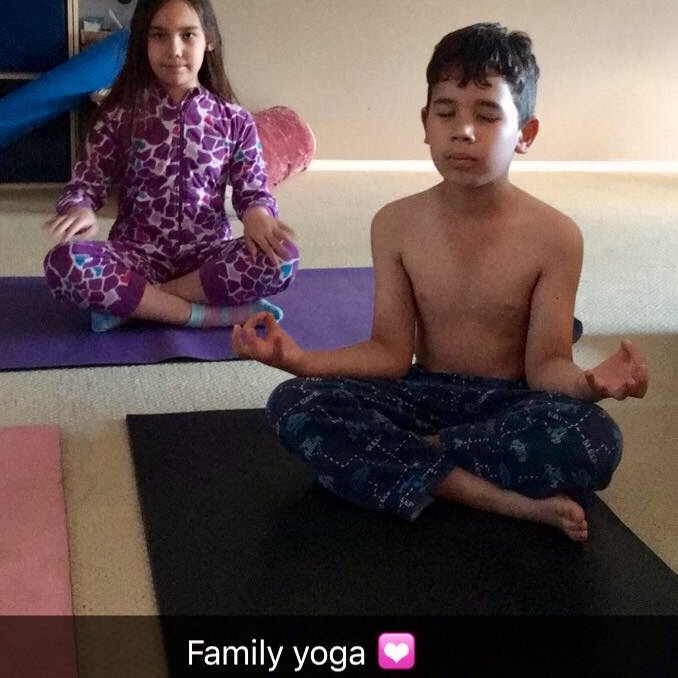 Isabelle has more “yoga experience” than Elias so she able to follow along and James helped Elias when he got tangled up because according to the kidlets yoga is “just like twister”. At the end of our wee yoga class, Elias headed off to bed and Isabelle (who stays up later than her brother) sat with me. Mum I know that was actual yoga, but I prefer mine. You know the one that tells the story? Fair enough – if I was 8 I’d probably prefer a story too. She decided that she’d like to spend the 30 minutes she had before her bedtime doing a Cosmic Kids yoga class (although she wasn’t impressed that they didn’t do the “real” tree pose). If you have kidlets in your house, check out the Cosmic Kids Yoga channel on youtube there are hundreds of videos of various lengths suitable for all ages. Monkey see – Monkey do ..